I have never met Donna in person, but I feel that I have. I approached her at the time when the book I co-authored was published. It was September of 2008. I was doing a blog tour for our book and Donna very kindly agreed to take the time to write the post on her blog. At that time she just came back from her summer exploration trip to Lithuania and we had some nice conversations about that part of the world. Since then we keep in touch. 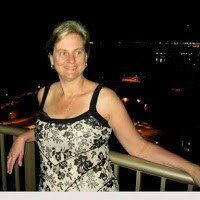 Donna Druchunas is an amazing person. When you talk to her you forget that she is a well-known writer of many knitting books, a published knitwear designer, and an internationally renowned teacher. 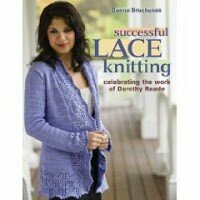 You might have read her interview on my blog when Donna’s book Ethnic Knitting Exploration came out in 2009. Here are some of her wonderful designs. So, this time, I wanted to hear from Donna about her life and get to know her better. If you are as curious as I am, let’s read the answers below. 1. When did you start knitting and who taught you? I started knitting when I was a little girl. I don’t even remember learning. My grandmother taught me. I remember making a swatch of yellow honeycomb cable when I was about six years old, so obviously I’d been knitting quite a bit before that. But I don’t remember any other things I made as a little girl. 2. When did you begin publishing your designs? I started publishing my designs in 2002 or 2003, I think. 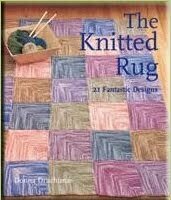 My first book, The Knitted Rug, came out in 2004, and I’d been publishing patterns in magazines for a while before that. 3. What is your most favorite knitting (crocheting) technique? My favorite knitting technique is lace. Although I initially struggled with learning lace, I’ve since become addicted to it. 4. When are you thinking about some new design, what inspires you the most? Is it different every time? Could you give us some examples on inspiration for some of your designs? I’m most inspired by traditional textiles from around the world. 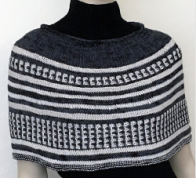 I’m interested in learning about knitting techniques, but I am also inspired by patterns used in weaving, crochet, and embroidery. I collect books about textiles from different countries. Right now I’m engrossed in a book about embroidery designs in Belarus, that was a gift from a friend. I can’t read the text, but the pictures are gorgeous. I would like to translate some of the motifs into knitting designs if I ever get caught up with my current projects! 5. What does your studio look like? My whole house in my studio! I have an office downstairs with floor-to-ceiling book shelves on three walls, a desk with my computer, and a big worktable for spreading out my research. Upstairs I have a “yarn room” that’s full of projects — finished and unfinished — yarn, fleeces, another work table with my swift and ballwinder and a carder. In my garage I have dye pots and equipment. I also have a laptop and wi-fi at home, so I travel around the house with my work, sometimes sitting in the den and watching TV while I’m knitting, or sitting in the back yard while I’m writing. Even my yard has dye plants growing here and there. And I spend a lot of time writing at the local coffee shop, too. Sometimes, even with all that flexibility, I just need to get out of the house ! 6. What is your most favorite place to knit (crochet)? I usually knit on the couch while watching TV and talking with my husband. 7. Do you spin your own yarn? I love spinning but I haven’t done much in the last few years. I recently gave my wheel away because my family has a tradition of not holding onto things we are not using when someone else could benefit. I have kept my spindles though, and I have some fleeces. I’d love to get more time to spin. 8. Do you belong to a knitting group? I don’t formally belong to a knitting group but lately I’ve been meeting with some knitters at my favorite coffee shop every Friday morning. I’m normally a very solitary person, but lately I’ve been feeling the need for more social interaction. 9. Are you in touch with other designers and how do you communicate with the knitters who knit your designs? I’m in touch with many other designers and knitters, mostly through email and the internet. It’s a wonderful thing to be able to talk to designers and knitters around the world! I can’t imagine my life without the internet. 10. Where can we see your published designs? My books are the best place to see my designs. I’ve published in most of the magazines, too, but lately I’ve been writing more articles and doing less freelance design work. I’m very much interested in empowering knitters to create their own designs, as well. That’s the theme of my books Ethnic Knitting Discovery and Ethnic Knitting Exploration. In both of those books, I have tried to provide knitters — even beginners — the tools to design their own accessories and sweaters, using the traditions and techniques I love from around the world. 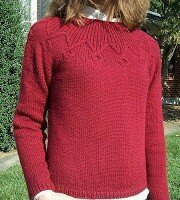 I also have PDF versions of parts of Ethnic Knitting Discovery available on my website and on Ravelry. 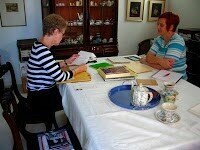 On the photo here I am sitting with June Hall visiting Marija, a Lithuanian knitter, at her home (2008). 11. Do you teach classes? If yes, where do you teach? I love to teach. I teach at local yarn shops, both here in Colorado and around the country, and I teach at a few fiber festivals every year as well. The last couple of years, I’ve also been teaching Europe. Next summer I will be teaching in Scotland, Switzerland, and Lithuania — and maybe more places! On this photo I am with my husband, Dominic Cotignola, in Geneva Switzerland (2009). I’ll be on that side of the Atlantic from June to September. I’ll be teaching in the states as well. In February, I’ll be doing workshops and lectures in Wisconsin, and in May I am teaching on an Alaska Cruise. I’m very excited about all of that. I love travel and I love knitting. I can’t choose a favorite so this is perfect for me. 12. What would you like to tell knitters who are timid and do not believe they are skillful enough to knit some of your designs? My advice to new knitters is to dive in and try whatever is calling to them. Ask for help at a local yarn shop or knitting group if necessary. Read books and look on the internet for videos. But if something frustrates you and you’re not having fun with it, put it away for a while and work on something else. Knitting is — first and foremost — a hobby and it should be fun! 13. What are your plans in the near future? 14. Can you share with us what your latest design is? I haven’t published many designs lately. I’m working on a book about Lithuanian Knitting, and I’ve written several articles about knitting and spinning for Spin Off and Piecework magazines. I’m totally obsessed with that topic lately. 15. Would you like to add anything about yourself? I love to continually learn new things, to explore, and to expand my mind and my skills. I never know what I’m going to do next because I allow myself to follow my passions and I embrace my obsessions. I couldn’t think of a better way to live. 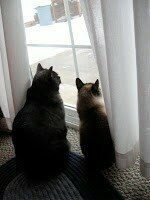 My cats Uno and DeeDee watching the snow.